In regard to this great book (the Bible), I have but to say it is the best gift God has given to men. All the good the Savior gave to the world is communicated through this book. But for it could we not know right from wrong. All things most desirable for man’s welfare, here and hereafter, are to be found portrayed in it. Let us have faith that Right makes Might, and in that faith, let us to the end, dare to do our duty as we understand it. I am not at all concerned about that, that the Lord is on our side in this great struggle, for I know that the Lord is always on the side of the right; but it is my constant anxiety and prayer that I and this nation may be on the Lord’s side. God selects his own instruments, and sometimes they are queer ones; for instance, he chose me to steer the ship through a great crisis. ‘A drop of honey catches more flies than a gallon of gall.’ So with men. If you would win a man to your cause, first convince him that you are his sincere friend. Therein is a drop of honey which catches his heart which, say what he will, is the high road to his reason. The true rule, in determining to embrace or reject anything, is not whether it have any evil in it, but whether it have more of evil than of good. There are few things wholly evil or wholly good. The power of hope upon human exertion and happiness is wonderful. Men are not flattered by being shown that there is a difference of purpose between the Almighty God and them. Bless all the churches, and blessed be God who, in this our great trial, giveth us the churches. How true it is that ‘God tempers the wind to the shorn lamb,’ or in other words, that he renders the worst of human conditions tolerable, while he permits the best to be nothing better than tolerable. It is no pleasure to me to triumph over anyone. I should be the most presumptuous blockhead upon this footstool if I for one day thought that I could discharge the duties which have come upon me since I came to this place without the aid and enlightenment of One who is stronger and wiser than all others. Galatians 1:3-5 — Grace and peace to you from God our Father and the Lord Jesus Christ, who gave himself for our sins to rescue us from the present evil age, according to the will of our God and Father, to whom be glory for ever and ever. Amen. by Charles Spurgeon (1834-1892), English preacher and author, 1869. As to a little trouble, who expects to find cherries without stones or roses without thorns? He who would win must learn to bear. Idleness lies in bed sick, where industry finds health and wealth. The dog in the kennel barks at the fleas, the hunting dog does not even know they are there. James 1:22 — Do not merely listen to the word, and so deceive yourselves. Do what it says. Proverbs 17:9 — Love prospers when a fault is forgiven, but dwelling on it separates close friends. In a home of which I know, a little boy—the only son—was ill with an incurable disease. Month after month the mother had tenderly nursed him, read to him, and played with him, hoping to keep him from realizing the dreadful finality of the doctor’s diagnosis. But as the weeks went on and he grew no better, the little fellow gradually began to understand that he would never be like the other boys he saw playing outside his window. Small as he was, he began to understand the meaning of the term death, and he knew that he was going to die. One day his mother had been reading to him the stirring tales of King Arthur and his Knights of the Round Table: of Lancelot and Guinevere and Elaine, the maid of Astolat, and of that last glorious battle in which so many brave knights met their death. As she closed the book, the boy sat silent for an instant, and then asked the question that had been weighing on his heart: “Mother, what is it like to die?” Quick tears sprang to her eyes and she fled to the kitchen supposedly to tend to something on the stove. She knew it was a question with deep significance. She knew it must be answered satisfactorily. So she leaned for an instant against the kitchen cabinet, her knuckles pressed against the smooth surface, and breathed a hurried prayer that the Lord would tell her how to answer him. Within a month many of the boys to whom Peter Marshall had just preached would go down to hero’s graves in strange waters. Soon all of them would be exposed to the risks and dangers of war, and Peter Marshall, under God’s direction, that very morning had offered them a defining metaphor about the reality of eternal life. From my sermon at the funeral of my mother-in-law, November 5, 2010. The sermon text is John 11:1-44. John chapter 11 begins with these words, “Now a man named Lazarus was sick.” JoAnn’s family in this past year has seen plenty of what that can be like. JoAnn was so sick, and suffered so much. What was the response of Jesus to this urgent appeal on behalf of his good friend? His response is confusing. First, Jesus said the illness would not result in death. Yet, he did not go to the home of Lazarus. Verse six says that Jesus stayed where he was for two more days. Jesus, who was friend of Lazarus; Jesus, the one on whom all were depending, did not answer right away. He delayed his departure. 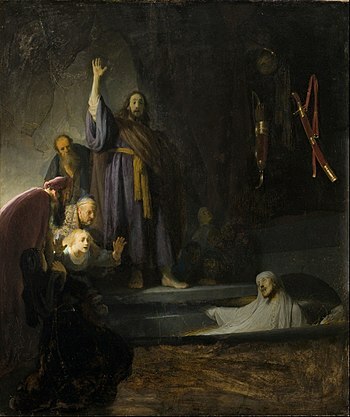 Finally, after a couple days, he was ready to go; but then he said to his disciples, “Lazarus is dead.” His disciples must have wondered about that. Jesus had healed so many people. He was able to do it. Why not even try to get there to help his good friend? Why? This is a common question, often asked at times like this. I have heard it asked by several of you: ‘Why must JoAnn’s suffering go on and on? Why doesn’t God answer our prayers?’ Once again, the events of this old, old story are not so far from life as we experience it. We face the same problems and the same questions. Finally, Jesus arrived at Bethany where Lazarus had lived. Lazarus had by now been dead and buried four days already. Family and friends were still coming to visit Mary and Martha, trying to bring to them a bit of comfort in their grief. But their dear brother Lazarus was dead, and no one could do anything about that. They felt the same helplessness and hopelessness we feel when the doctors say there is no more they can do, when you sit by the side of a loved one in their last days, or when you get the word that death has come. Even with all that modern medicine can do, the time of helplessness still comes. Old age, illness, and finally death still get their way with us– every time. Then Jesus speaks again, saying “I am the resurrection and the life, he who believes in me though he die, yet shall he live again.” Jesus speaks the word of the promise, but Lazarus is still dead. There is yet, further delay. This first century story is just like the story we have been living with JoAnn this past year in almost every way. We have seen sickness, we have prayed to Jesus, we have been puzzled by his response, we have faced the death of our loved one, and we are now experiencing the grief that follows. We, like Mary and Martha in the story, have received a promise, a word from Jesus. “I am the resurrection and the life,” he said, “He who believes in me, though he die, yet shall he live.” That promise has been given to all who will hear and believe it. Now, we lack just one thing. Jesus raised someone from the dead on that long ago day, and Lazarus was given a few more years of this life. And we aren’t looking for that here today. But we do know that the raising of Lazarus was just a small hint of things to come. That was just one little resurrection from one little old tomb, but that great ‘gettin up morning’ of everybody on that wonderful day when Jesus returns is yet to come. Be assured of this, it will happen– maybe tomorrow, maybe in a thousand years. We have to wait and see. Even in this Gospel story, Jesus delayed before he acted. And today, we will have to deal with a longer delay. But the hope and the promise and the future reality are all the same for us as it was for Lazarus: the dead who die in Christ will live again. It is for us now to believe the story, take hold of the promise, make it our own, and then one day know and experience the final and complete healing of the resurrection unto life everlasting. Psalm 121:8 says, “The Lord will watch over your coming and going both now and forevermore.” The Lord is always watching over each of us, and is, even now, still watching over JoAnn. It is just that early last Monday morning, JoAnn quietly passed from the now part of that promise to the forevermore part, and for that we give God our thanks and praise. It is that ‘forevermore’ part of the promise that gives faith the ability to make adjustments in our plans and in our hopes and in our prayers. Faith adjusts itself, not to lowered expectations and smaller hopes, but to an ever increasing trust and an ever deepening hope. We pray for healing and then things get worse. Then, faith then adjusts its prayers to praying for the strength to endure, to giving thanks for the life lived, and finally to a focus on that eternal home with God, where God will wipe away every tear from our eyes, and there will be no more pain, or grief, or death. With faith in God we always have a fall back position– until that day when we fall back into the arms of Jesus. Psalm 122:8 — The Lord will watch over your coming and going both now and forevermore. O Thou Eternal One, we who are doomed to die lift up our souls to thee for strength. We know that at some turn of our pathway Death stands waiting to take us by the hand and lead us. We praise thee that to us he is no longer an enemy but thy great angel and our friend, who alone can open for us the prison-house of pain and misery and set our feet in the roomy spaces of a larger life. Yet we are but children, afraid of the dark and the unknown, and we dread the parting from the life that is so sweet and from the loved ones who are so dear. Grant us of thy mercy a valiant heart, that we may tread the road with head uplifted and a smiling face. May we do our work to the last with a wholesome joy, and love our loved ones with an added tenderness because the days of love are short. On thee we cast the heaviest burden that numbs our soul; the gnawing fear for those we love, whom we would leave unsheltered in a selfish world. But we will trust in thee, for through all our years thou hast been our stay. O thou Father of the fatherless, put your arm about our little ones! We thank you that we have tasted the rich life of humanity. We bless thee for every hour of life, for all our share in the joys and strivings of our brothers and sisters, for the wisdom gained which will be part of us forever. If soon we must go, still we know that through thee we have lived, and pray that by thy grace we have helped to shape the future and bring in the better day. If our spirit droops in loneliness, uphold us by thy companionship. When all the voices of love grow faint and drift away, thy everlasting arms will still be there. Thou art the Father of our spirits; from thee we have come; to thee we go. We rejoice that for those who abide in thee, death is but the gateway to life eternal. Into thy hands we commend our spirit. Amen. Jesus hears Bartimaeus and asks that he be brought forward. Jesus said to him, “What do you want me to do for you?” Bartimaeus replied simply, “Rabbi, I want to see.” And then Jesus says, “Go, your faith has healed you,” and immediately, says verse 52, the man received his sight and followed Jesus along the road. Of all the many people around Jesus that day, it is the blind man who ‘sees’ most clearly. In fact, it is because of his blindness that he is more aware of his desperation than many of the others who met Jesus. Others had seen Jesus do miracles, but they wanted to debate Jesus on where his power came from and by whose authority he did such things and whether or not he should heal on the Sabbath and so on, trying so hard to see everything that they missed what was most important. Bartimaeus was not interested in any of that. He was desperate, and all he wanted to do was make his plea to Jesus and cling to him. His desperation became his strength, and he was praised for his faith. He, like the believers in Pastor Manuel’s church in yesterday’s meditation, knew he needed God. We can be thankful that we are not in desperate economic circumstances like those in Pastor Manuel’s church. And if we have our eyesight, we can also be thankful. We do not want to live our lives in desperation, and if have been blessed enough to be able to make ourselves secure and comfortable, that is something to be thankful for. Tough times come and go for everyone, but we do what we can to build in stability and peace as much as we can. We want that, but at the same time we have to realize the danger to our soul and spirit that comes along with safety and security and well-being. One of the devil’s oldest and most effective tricks is to use God’s own blessings to lead us away from God. The more God blesses us, the more we can be tempted to feel secure enough to not need God; and this can become an even worse blindness than the physical blindness which afflicted Bartimaeus. Jesus once asked, “What does it profit you if you gain the whole world but lose your own soul?” To put it another way, it would be far better to endure for a few years the grinding poverty of Pastor Manuel’s people and keep your faith alive unto death, than to gain the whole world for a few years and lose your eternal hope. There is no long term security for anyone except in God. Desperation reminds us of that in ways that we might forget when times are good. Why did church attendance increase all over the country after the 9/11 attack on America? Because people were reminded that life is short and uncertain, and this world is a dangerous place. Why did church attendance then decrease again after a few weeks? Because people soon forgot that. Church attendance is of course not the only measure of a people’s faith and spirit, but it is an important indicator, and, it is a weekly reminder of our eternal soul and that we need God. One more important thing. It has been the experience of many people that when they most desperately need God, God seems far away. We can see this even in the Bible; most certainly in the Psalms, and also in the Prophets and in the Epistle’s, and even in Jesus himself. In becoming a man, Jesus emptied himself of all divine power, says Philippians chapter 2. So, in times of need he had to pray to God for help and support. And when did he need such help more than when he was on the cross? And his heavenly Father did not then seem very close to Jesus, for some of his last words from the cross were, “My God, my God, why have you forsaken me.” That is how it can feel for a believer, even when he or she most desperately needs God. But then one must simply continue to cry out, like Bartimaeus; even when the Savior cannot be seen, even when all looks hopeless, even when, for a time, it seems like there will not be a response. Yet in our crying out to God we are closer to God than we are when we are comfortable and our every need is meet and we are not looking to God at all. Manuel is the pastor of several small, very poor congregations in rural Honduras, the second poorest nation in the Western hemisphere. Todd is the pastor of a large and wealthy congregation in Baltimore. In the 1980’s, Todd and Manuel were roommates in college. A while back, Todd went to Honduras to visit Manuel. Todd could not believe the poverty, the poor housing, the meager incomes, the poor health care, and the lack of food. Todd was feeling sorry for Manuel and how he had to live and minister in such desperate circumstances. Though BUT is a simple and common word, it is one of the most wonderful words in the Bible. As you remember from your grammar lessons in school the word ‘but’ serves as a conjunction in sentences. Conjunctions are words that join together other words or phrases. The two most common conjunctions in the English language are the words ‘and’ and ‘but.’ The word AND combines similar words or thoughts, like “Jim and Jack and Tom are all going to the ball game.” The word BUT, on the other hand, introduces something new, or different, or contrary, into the sentence; such as, “Jim and Jack are going to the game, BUT, Tom has to stay home because he is sick.” The word BUT signals that the sentence is about to go off into another direction. Keep the faith– and keep looking for, praying for, and waiting for the ‘buts’ in your story. Ecclesiastes 3:1… 8b — There is a time for everything, and a season for every activity under the heavens:… a time for war and a time for peace. By Frederick Buechner in Beyond Words: Daily Readings in the ABC’s of Faith, (HarperOne, 2004). To have grandchildren is not only to be given something, but to be given something back. You are given back something of your children’s childhood all those years ago. You are given back something of what it was like to be a young parent. You are given back something of your own childhood even, as on creaking knees you get down on the floor to play tiddlywinks, or sing about Old MacDonald and his farm, or watch Saturday morning cartoons till you’re cross-eyed. 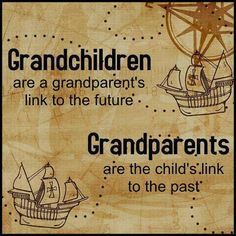 It is not only your own genes that are part of your grandchildren, but the genes of all sorts of people they never knew, but who, through them, will play some part in times and places they never dreamed of. And of course along with your genes, they will also carry their memories of you into those times and places too– the afternoon you lay in the hammock with them watching the breezes blow, the face you made when one of them stuck out a tongue dyed Popsicle blue at you, the time you got a sliver out for one of them with the tweezers of your Swiss army knife. On some distant day they will hold grandchildren of their own with the same hands you once held them by. In the meantime, they are the freshest and fairest you have. After you’re gone, it is mainly because of them that the earth will not be as if you never walked on it. Psalm 128:6 — May you live to see your children’s children. Peace be on Israel. Proverbs 17:6 — Children’s children are a crown to the aged, and parents are the pride of their children. Psalm 78:4-7 — …We will tell the next generation the praiseworthy deeds of the Lord, his power, and the wonders he has done. He… established the law in Israel, which he commanded our ancestors to teach their children, so the next generation would know them, even the children yet to be born, and they in turn would tell their children. Then they would put their trust in God and would not forget his deeds but would keep his commands. Psalm 103:17-18 — From everlasting to everlasting the Lord’s love is with those who fear him, and his righteousness with their children’s children— with those who keep his covenant and remember to obey his precepts. Since my youth, God, you have taught me, and to this day I declare your marvelous deeds. Even when I am old and gray, do not forsake me, my God, till I declare your power to the next generation, your mighty acts to all who are to come. Amen.